Donna Leon’s Drawing Conclusions is my choice to illustrate the letter L in Kerrie’s Crime Fiction Alphabet. This is the 20th book in her Commissario Guido Brunetti series. Brunetti is somewhat of a rarity in crime fiction novels – a detective who is happily married with two children. He doesn’t smoke or drink to excess and often goes home for lunch to his beautiful wife Paolo. 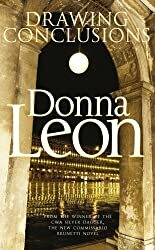 It’s set in Venice where Donna Leon has lived for many years. I was immediately drawn into this book, with its wonderful sense of locality, believable characters and intricate plot. Anna Maria Giusti discovers her elderly neighbour Constanza Altavilla lying dead on the floor of her apartment. Apparently she has died from a heart attack but Brunetti, called to the scene because there was blood on the floor, suspects that she may have been attacked as there are bruises on her neck and shoulders. His boss, Vice-Questore Patta wants to close the case but Brunetti decides to make further investigations. He meets Signora Altavilla’s son and visits the nursing home where she had been helping out. His suspicions are further aroused when the nun in charge of the home is reluctant to answer his questions and by the conversations he has with some of the people she visited. With the help of Inspector Vianello and Signorina Elettra, Patta’s secretary, he discovers a network of deception and lies. It’s well-paced and there are several unexpected twists that kept me wondering almost to the end what had actually happened to cause Signora Altalvilla’s death. It’s more than crime -fiction as Brunetti ponders on life, the problems of ageing, and the nature of truth and honesty. I didn’t want the book to end – that’s how good it is. I’ve read a couple in this series and I actually have this one waiting unread because I wondered if I needed to read the earlier ones first in order to properly enjoy it. What do you think? Annie, I’ve only read one of the earlier books. Whether I’d have enjoyed this more if I’d read them all in order I’ll never know! But I did enjoy this very much indeed. I think it would stand well on its own if I hadn’t read any them before. I’ve read the first five, fifteen to go! I love anything set in Venice, and Brunetti is a wonderful character. Margaret – What a fine choice for “L!” I happen to be quite a Brunetti fan, and I haven’t gotten a chance to read this latest one yet. But it’s on my TBR, so thanks for the reminder that I need to read it. I have read all of her books except this one. You do not have to read them in order. Since I only started reading Ms. Leon’s series about 8 years ago, I have jumped all around the series as I located the books. However, in each book you find out a little more about Brunetti’s family life. I go to Venice every other year for an extended stay, and my wife swears that I am always on the lookout for both Ms. Leon and Commassario Brunetti. Since I am so familier with Venice I can picture the physical settings in my mind. She is my favorite crime novelist. Somehow, I have missed that one. I usually get bored with crime fiction series, but Donna Leon is the big exception form the rule. I can’t get enough of Brunetti, his family and his colleagues. I agree that you don’t have to read the books in order, but it’s fun to do it just to see the relationships between the characters evolve. As I have got older I am more honest when I do or don’t like a book or author.Donna Leon is not for me. I don’t like her style nor do I recognise the Venice she sets her books in. As a crime writer there are better . Salley Vickers or Ian Mcewan bring more of the mystery and magic of Venice into their novels. On a lighter note maybe I am just jealous of her ability to live there ….if only!! I’ve heard so much about this series, I just have to find some of Leon’s books to read. A detective who’s happily married? What a nice change!